In the past, if you’d asked me to describe what travelling was, I would have said something about going on holiday to foreign lands I’ve never visited before. Something exotic or distinctly different, whether in language, culture or landscape. But the curiosity and increased attention to detail I’ve developed through travel photography has made me change the way I think about travel. You don’t have to leave your home town to travel. I truly believe that travelling is a mindset, more about the way you explore, interact with and see the environment you’re in and less about being away from home. If you’re curious about the place you’re in, learning new things and looking at everything with fresh eyes then you’re travelling. Sure being in a foreign country may make it a bit more exciting, but it’s not a requirement. With this in mind I’ve been making more of an effort to get out and see Geneva. Just me and my camera, I’ve spent time in each of three neighbourhoods that best represent what it has to offer from an architectural perspective. 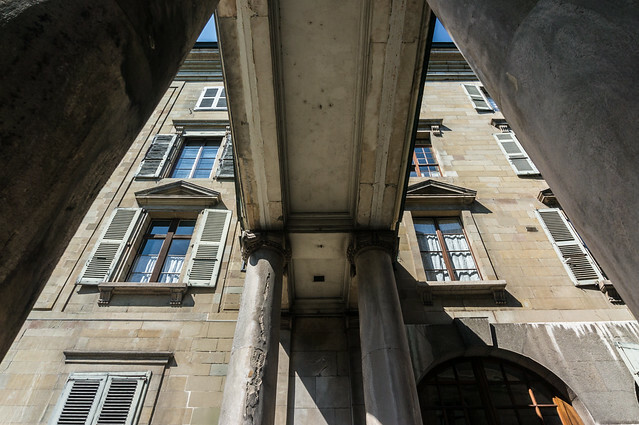 Architecture, Eaux-Vives, Geneva a photo by Flights. Camera. Satisfaction. on Flickr. My local neighbourhood in Geneva, Eaux-Vives definitely has a distinct character. Situated right on the eastern shore of Lake Geneva, its lakeside location is unarguably its greatest attribute. But look a little deeper and you’ll find a wide variety of architectural styles in the area with some fantastic colours and interesting facades. 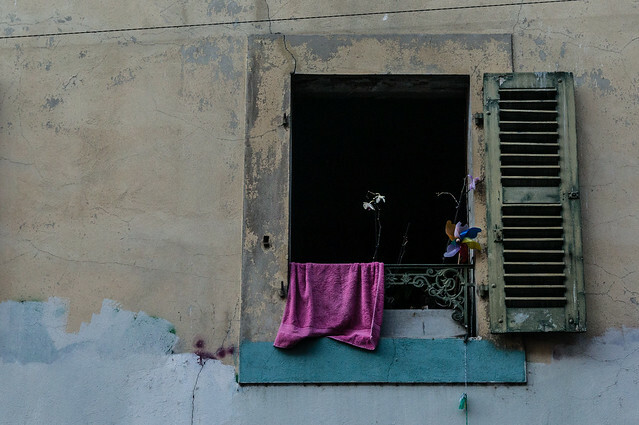 Window, Eaux-Vives, Geneva a photo by Flights. Camera. Satisfaction. on Flickr. Part of the appeal is that wandering its streets you’re never quite sure what you’re going to find around the corner. A great example is this worn and unkept building that’s been adopted by the homeless. It certainly makes a great subject for photos! Old Town, Geneva a photo by Flights. Camera. Satisfaction. on Flickr. 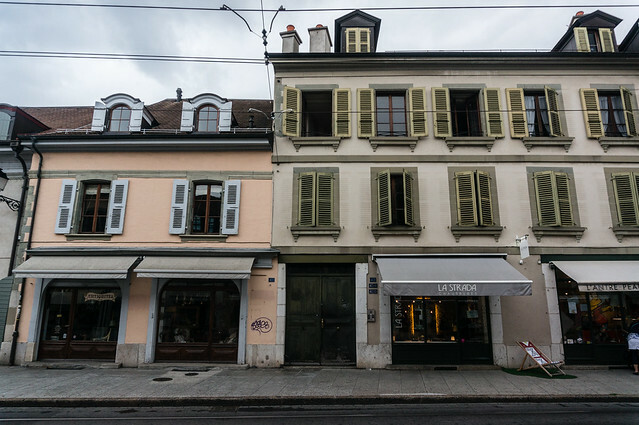 The old town (Vieille Ville) is undoubtedly the most picturesque (and expensive) neighbourhood of Geneva. Many would say its highlight is the Cathedral of Saint Pierre, but for me its real, simple pleasure lies in the beautiful stonework that shines brightly in the sunlight. 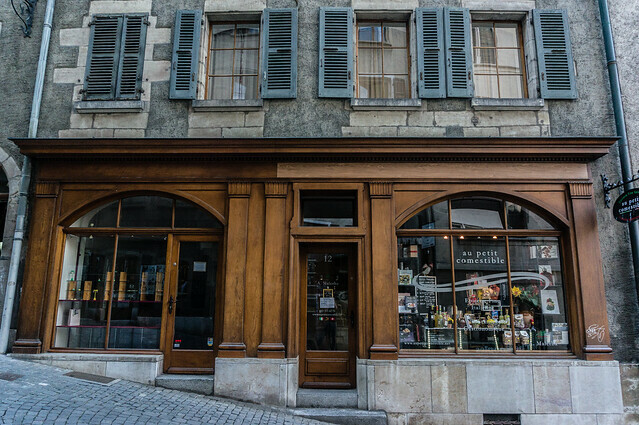 Wooden Facade, Old Town, Geneva a photo by Flights. Camera. Satisfaction. on Flickr. Situated atop a steep hill it is an effort to reach. But with charming narrow streets and architecture strongly influenced by its French roots, it rewards you with what for me is the best old town in Switzerland. 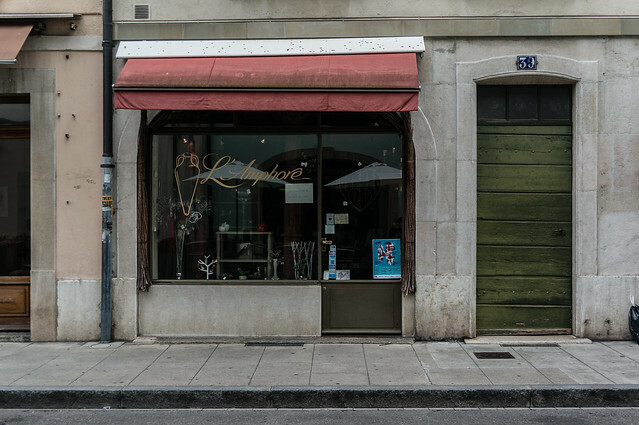 Shopfront, Carouge, Geneva a photo by Flights. Camera. Satisfaction. on Flickr. Just a ten minute tram from the centre of Geneva, the area of Carouge feels like a world away. Everywhere you look there are cafes, art galleries and after nightfall some of the best small-scale drinking spots you’re likely to find. Architecture, Carouge, Geneva a photo by Flights. Camera. Satisfaction. on Flickr. It almost feels like a town of its own, with the influence of its Italian architects evident around every corner. 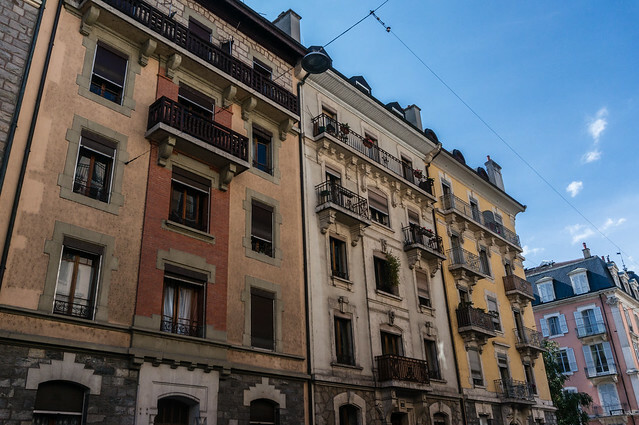 The three-storey block houses, many with quaint internal gardens, are a very different proposition to the taller less uniform buildings in central Geneva. I would strongly encourage everybody to try and look at travelling in this way. By taking a fresh approach to where you live you’ll be surprised what you find, things you’ve never noticed before. Not only that, it will also alleviate the incorrect assumption that to travel you must go abroad. 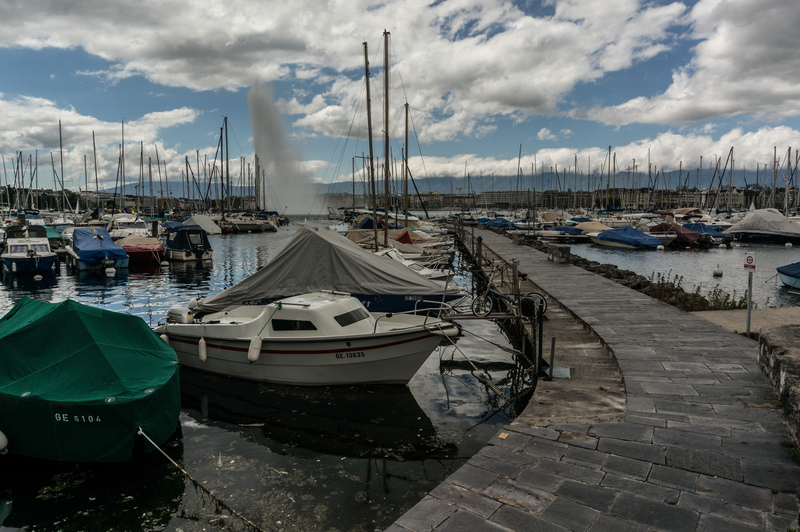 I’ve certainly found myself much happier in my home environment by taking this approach, thinking about Geneva as a place to explore and discover rather than just somewhere to live. I always think how lovely the place is I call home when I’m coming back from travelling, and always put it high on my list to explore the region more! But somehow I never see to find the time to do so, I really put that on top of my 2014 bucket list! I think it’s really easy to dismiss what’s nearby to home as mundane, especially if you’re travelling a lot. Sounds like you’re trying to make the most of it though! Good luck for 2014! Nice piece of writing Ben. Love the photography also. You are right – we can shift our mind set and be a lot happier when we realise that travelling doesn’t need to mean outside your own country or ‘adopted’ country. . Normally tourists see more of someone’s home town than the residents. I plan to spend more time getting to know my city (Brisbane). Thanks Helen! That’s exactly it, when I went back to London as a tourist for a weekend I realised how incredible it was and thought “Hey I used to live here, what was I doing?!”. I then vowed never to make the same mistake again. I hope you have a great time exploring Brisbane. “travelling is a mindset” I totally agree with you there! I can really travel to my favorite coffee shop!